Hey everyone! The Geeky Seamstress here. 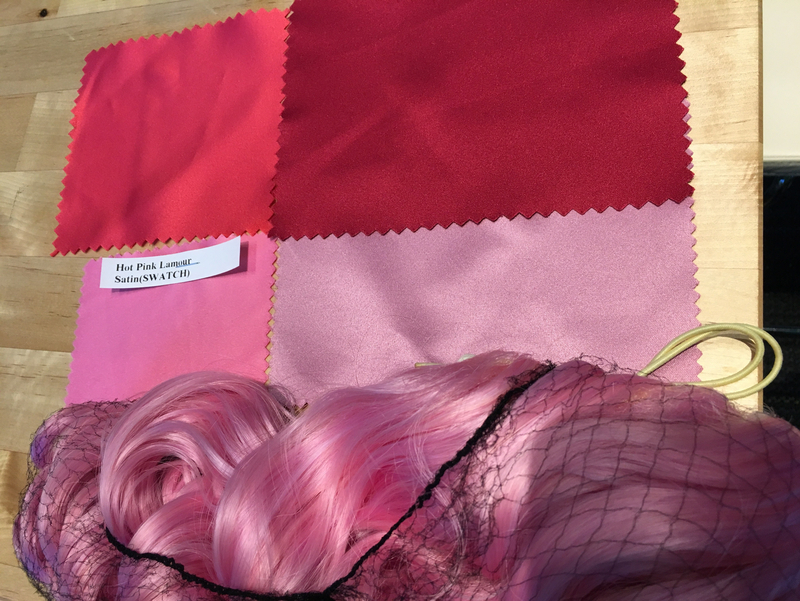 A question we frequently get in regards to senshi fukus is where we get our materials. We’re fortunate to live close to a great fabric district in Dallas that meets most of our needs, but not everyone has that kind of resource! Today, we’re going to talk about where you can get materials for your fukus both online (or in-person if you happen to make it to Texas :)). SpandexWorld (online): white moleskin. This is an expensive option, but it’s what I use for many of my commissions! Yaya Han fabric line at Jo-Ann’s (in-person and online): jumbo spandex. Again, this is a fairly expensive option priced at $34/yd in our area without a coupon. That said, if you have access to a Jo-Ann’s, you can probably find this fabric. Make sure to use a coupon using the Jo-Ann’s app or website! Golden D’Or (in-person): dritex. This is a great Dallas-based shop off of Harry Hines in the fabric district. This material is normally $13/yd and in the Spandex Room. 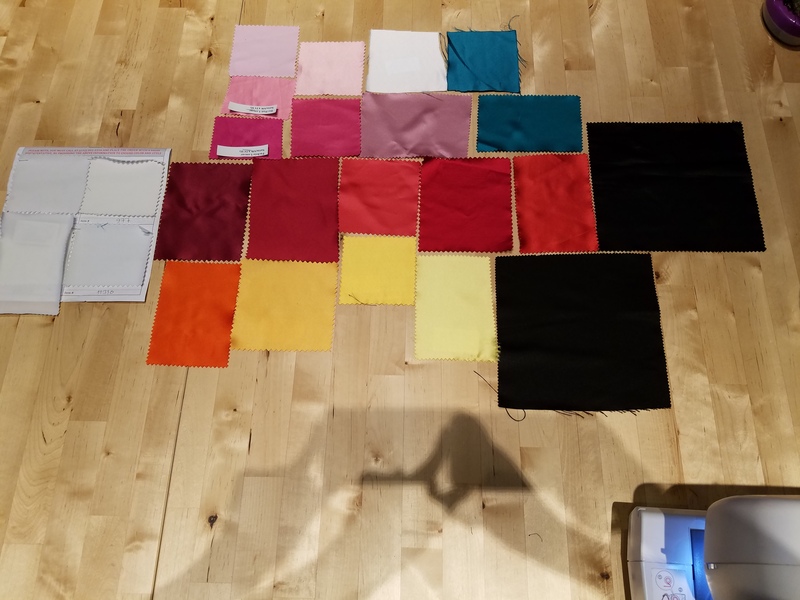 We’ve had a few times where the material has factory defects right in the center of the fabric, so make sure to check your yardage before the employees cut it! They also have quarterly store-wide sales with 20% off your entire purchase coupons, so make sure to sign up for their mailing list! We Love Colors: You might recognize this company based on our glove recommendations! They also offer a dull tricot in 1.5 yd cuts. We’re using this for our 2018 outer senshi build. If you’re on the smaller side, you can get away with a 1.5 yd cut with some clever pattern placement. Otherwise you’ll likely need to order 2 cuts. Fabric Wholesale Direct (online): matte milliskin tricot. This company sells tons of fabrics at some very great prices, and their swatches and products generally arrive quickly. Their customer service has been great any time we’ve needed help, too! Bridal satins are a wonderful material for flowy fuku skirts and beautiful bows! A heavy bridal satin will wash well, iron beautifully, and look great in photos. When shopping for satin online, look for matte bridal satin. Peau de soie is also a great option, as well as Duchess Satin (or L’Amour). If you have enough time, make sure to order swatches! They’re normally $2 or less and help ensure that you’re ordering the best material possible for your project. Casa Collection at Jo-Ann’s (online and in-person): Matte Satin. This used to be the standard for sailor fukus, but unfortunately many of the senshi colors are discontinued. You can still occasionally find some fabrics that will work, like blues for Moon and Uranus and some good yellows. If you use this line, make sure to grab the regular matte satin. It looks great with fukus! OnlineFabricStore (online): Peau de Soie. 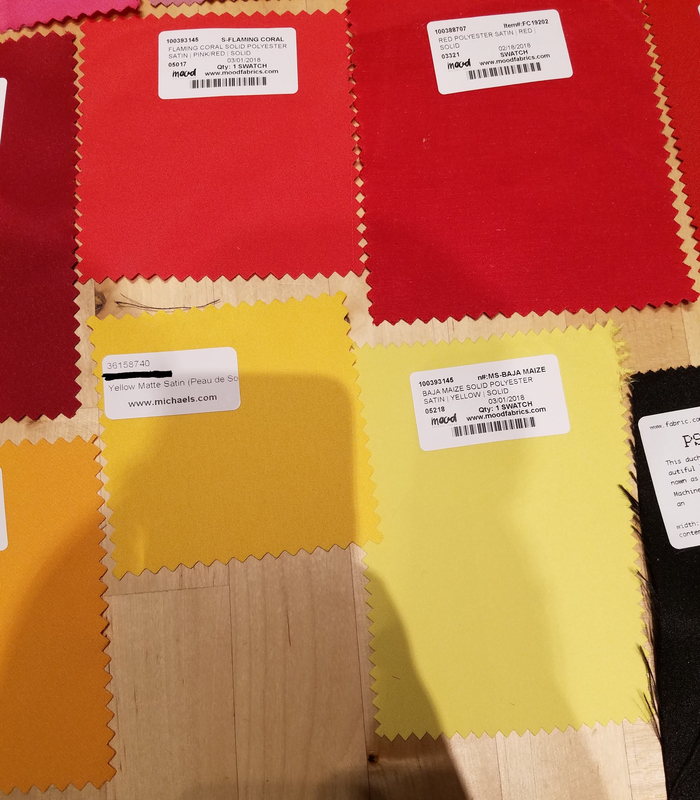 OFS has a HUGE range of matte satins available for fukus, even some in the stranger/harder to find colors like orange and teal. Plus, their peau de soie is normally about $5.50/yd. The only drawback to OFS is they can be hit or miss in terms of shipping, so make sure you order well in advance of your deadline! 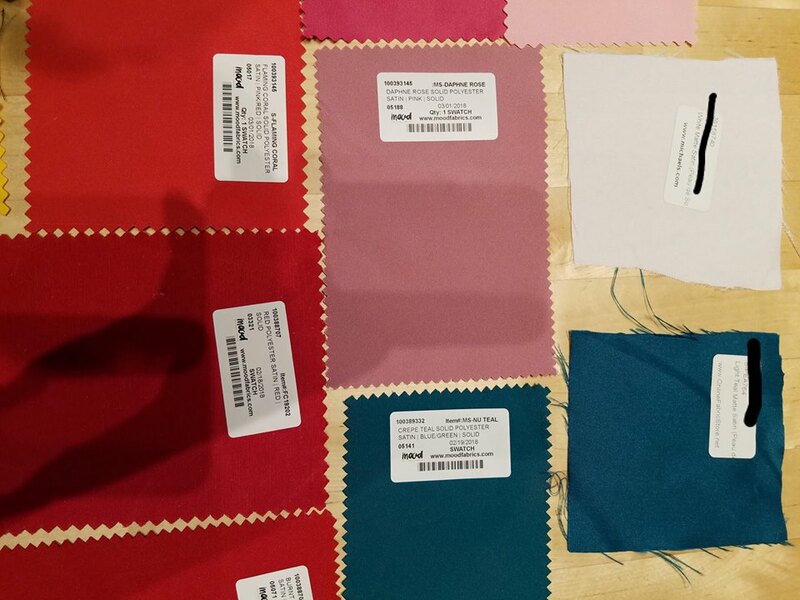 Mood Fabrics (online and in-person): Polyester Satin. The selection here isn’t quite as large as OFS, but they have lots of beautiful materials! Polyester satins normally run about $8/yd and shipping is a bit on the higher end. I adore their Kelly Green for Jupiter! Fabric.com (online): They have TONS of great satin options here. The Duchess satin is very nice, but the color selection is somewhat limited. The Telio satins are WONDERFUL. I’m using navy Telio satin for my Sailor Uranus fuku, and it’s a dream. Fabrictopia (in-person): Polyester Satin. This shop is on Perth Street in Dallas about a quarter of a mile away from Golden D’Or. If Golden D’or doesn’t have a good satin for a senshi, I check them out. They have a wide assortment of polyester satin for under $6/yd by the cutting table in the main room! Plus, they’re super generous with cuts. 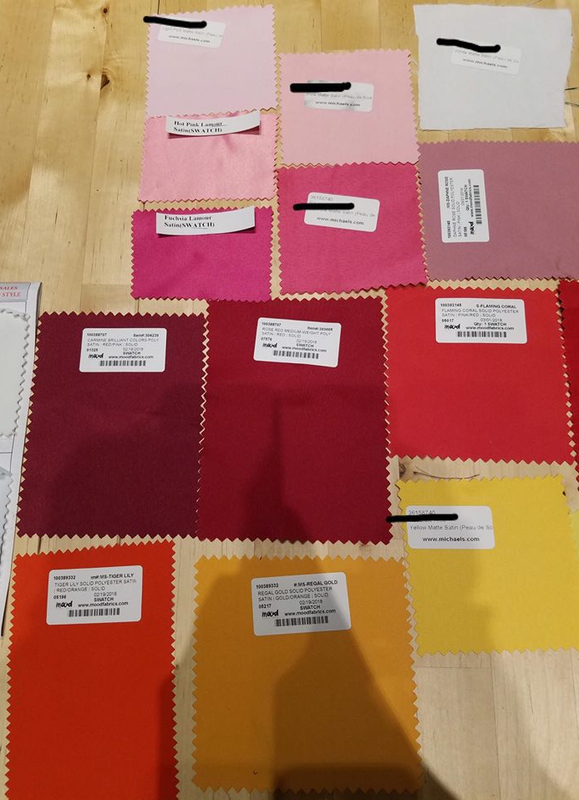 eBay (online): Some of the fuku colors are really difficult to find in-person, so we’ve had to turn to eBay in the past to locate fabric. When searching, make sure to check return and sample policies. Look for: matte bridal satin, peau de soie, duchess satin, or l’amour satins. 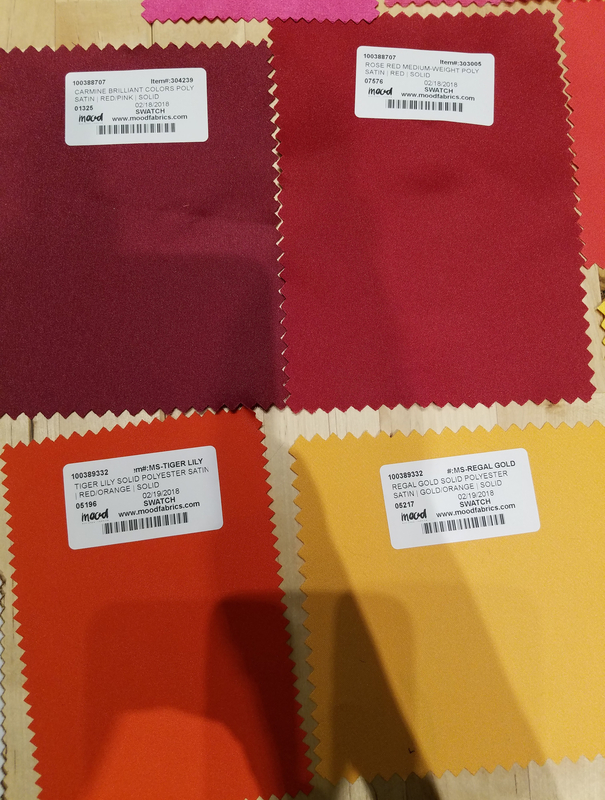 Some shops will send you samples or swatches if you ask! Quality can be hit or miss, so also make sure to check reviews of sellers. 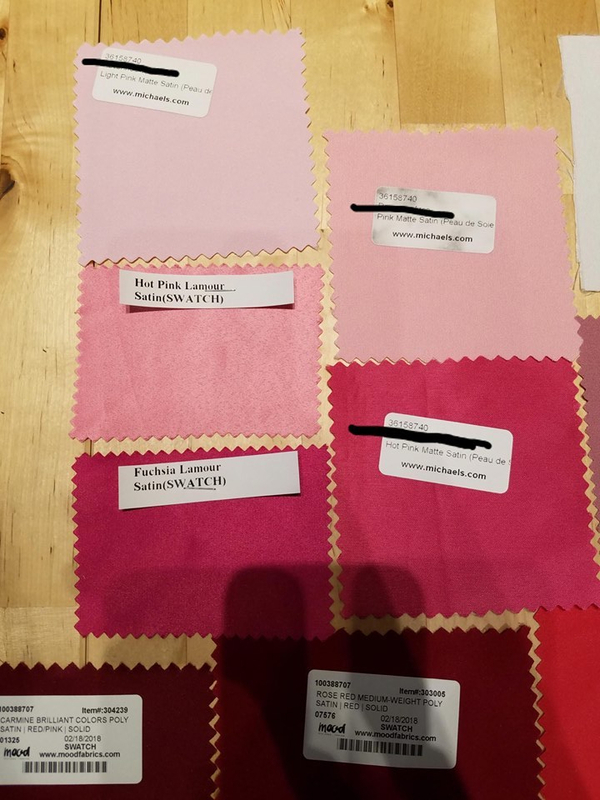 Fabric Empire Store (online): We’ve ordered a few swatches from them, and they have TONS of colors in L’amour satin! They also have foam by the yard, though we haven’t tested this yet. Michael’s (online): When Hancock Fabrics went out of business a few years ago (a moment of silence… okay, we’re good), Michael’s acquired their fabric. 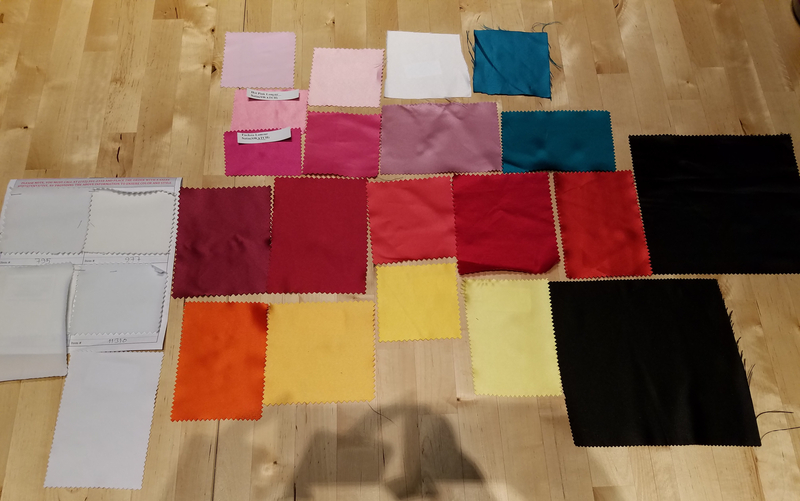 We were so excited to discover that one of the fabrics they carry is peau de soie! Just do a search for peau de soie in Michael’s online shop to find a huge variety of colors. 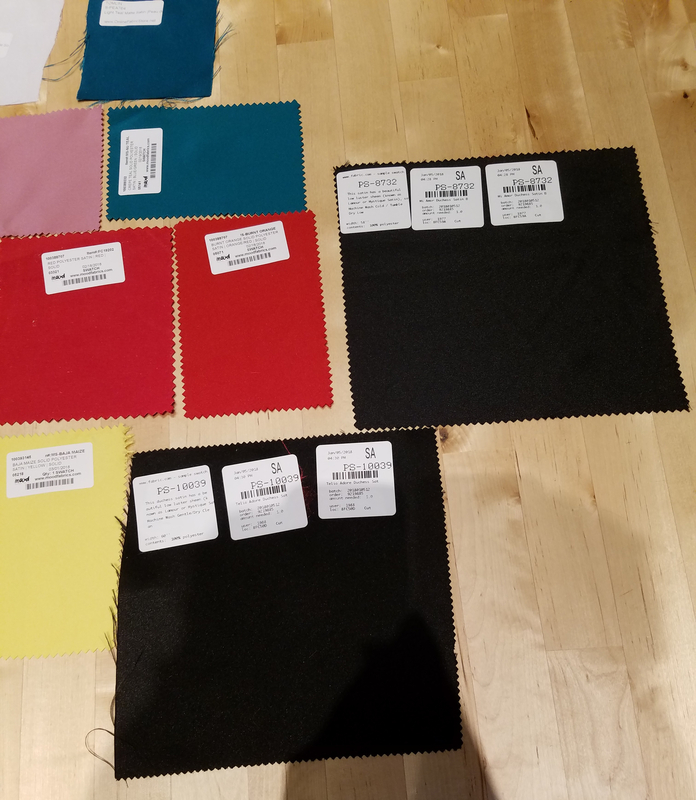 Fabric Wholesale Direct (online): We mentioned them earlier, but we’re mentioning them again because they seriously have a HUGE variety of fabrics, including competitively-priced peau de soie! We get LOTS of questions on where we get our foam. We get ours at Golden D’or, and they carry it in their upholstery section (we use 1/2″ foam just FYI). Our advice for finding foam is to look for 1/2″ upholstery foam in WHITE. Green and yellow foam will show through the white of the fuku unless you use several layers of spandex. Additionally, sometimes the foam can oxidize and turn yellow. If that happens, add another layer of spandex over your foam pieces to prevent it from showing through. Jo-Ann’s (online and in-person): Foamology Project Foam or Airtex. This is a great resource in a pinch. For my latest fuku commission, I was just barely shy of enough material to make the chest armor sleeves, so I tried this out. It works pretty well! It’s not quite as dense as the stuff I normally use from Golden D’Or, but it’s a pretty good substitute. Horsehair braid: Sew True. Thanks to Ohheyabear Cosplay for letting us know about this! We hope this helps! Do you have a go-to resource for your fukus? Please share it with us in the comments below!